Fruits come in all different shapes, sizes, and flavors. All of them are essential and have large fan bases. If you crave something quick on the go, an apple, banana, or a handful of grapes does the trick. But, the best fruit to sit down and enjoy is the cantaloupe (this is my food hot take, deal with it). Movies have a few different genres, all available to fit the mood of an audience. Action-packed thrillers might be your cup of tea. Modern comedies might be what gets you through a lazy weekend. That said, Forrest Gump, even on the hundredth time around, is still best cinematic viewing experience. Variety is the spice of life. We need multiple variations of things we enjoy in order to satisfy our day-to-day desires. However, through the mixed bag of choices and flavors that appeal to us, there is always going to be one particular option that stands ahead of the pack in terms of quality. The growing population of NBA superstars certainly follows this theme. Due to the evolution of the game, star talent throughout the league is becoming deeper than any past generation. There’s a top-10 player with a skill-set, personality, and physical makeup for every fan. Still, majority of the NBA’s attention-grabbers and MVP candidates are the stars with aberrant athleticism, brawny physiques, and a combination of height and strength that make them unstoppable on the court by nature. LeBron James, Kevin Durant, Giannis Antetokounmpo, Kawhi Leonard, and Anthony Davis are all at least 6'7" with exceptional God-given dominance that inherently makes them offensive forces. In a league that’s truly a melting pot among different playstyles, the pick of the litter is usually one of these players — a versatile forward or center that has the appearance more in line with what we’ve seen in historical “greatest player of the decade” conversations. Michael Jordan, a 6'6" guard with a strong frame during his era, is really the smallest player that’s universally in the top five to grace the court. Actually, if you just write down the 10 greatest legends in league history, Jordan is the smallest. It’s just always how the NBA — and basketball as a whole — has operated. Stephen Curry is a very different breed of a superstar, especially when compared to his peers. Variety in the NBA is imperative when trying to broaden the popularity and viewership. 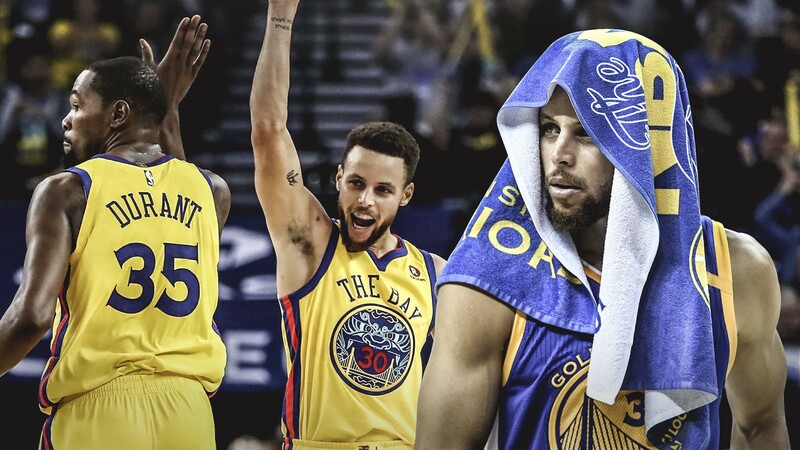 Curry has given the basketball world a contrasting style to latch onto since his rookie season in 2009–10, but also started to mold into an upper-echelon force in 2014. 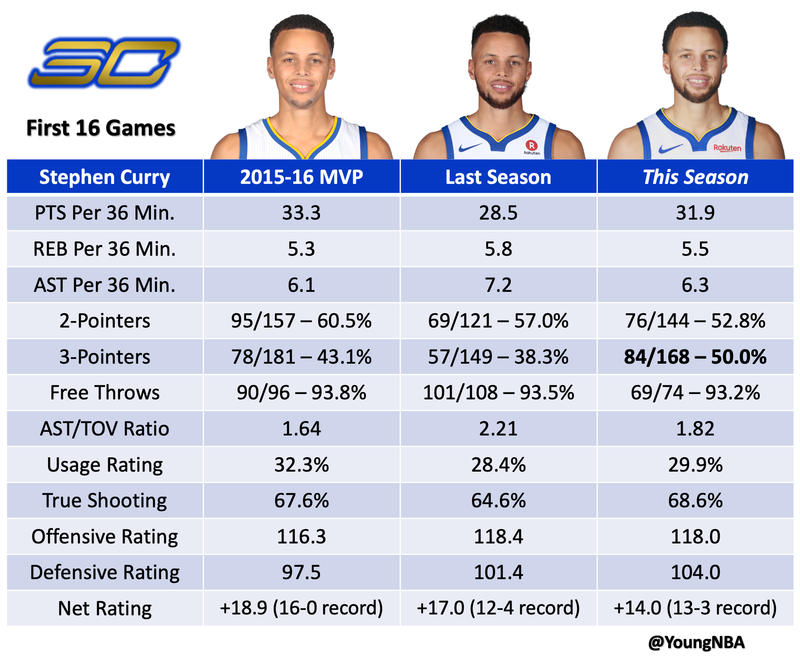 Now, production-wise and how he impacts a team, Curry is the best player in the sport. It’s a statement that tends to make lifelong basketball fans a little uneasy. 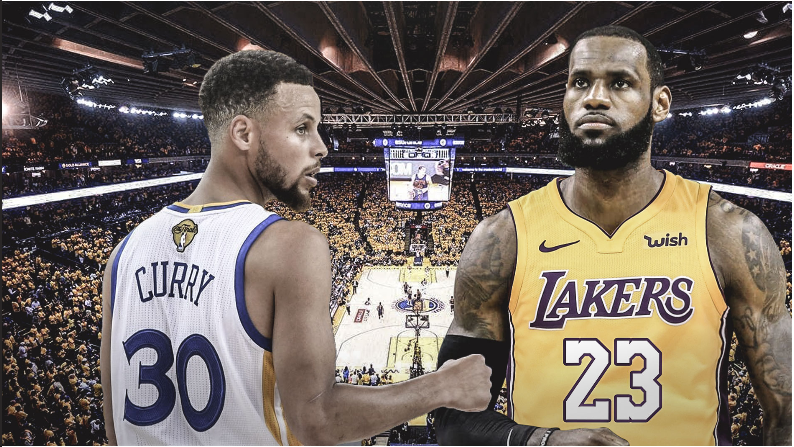 There’s a strange revolt against anyone with Curry’s size, attributes, or preferred style overtaking James as the “face of the league.” He stands 6'3", between 190–200 pounds, and is constantly targeted defensively in the pick-and-roll when bigger guards and forwards want to isolate. Most people don’t feel comfortable handing the throne to a player without the same heavy-duty, “do it all” capabilities that James, Durant, Leonard, and Antetokounmpo possess. Two-way player is a term that became popular a few years ago, and three of those names above have perfectly fit the description. Durant (30), Leonard (27), and Antetokounmpo (24) are all exceptional and active defenders while also scoring in preposterous ways. While James (34) has dialed back his defensive concentration, he still expresses his versatility with the most meticulous scoring and playmaking combination we’ve ever seen. Externally, Curry isn’t like those machines. Internally, though, his software is just as smooth and his brain processes the game the same way — with the exclusion of James, it’s even more advanced. Now after a decade in the league and three championship rings, Curry is a seasoned veteran that has faced (and desolated) any type of defense imaginable. You cannot have Curry’s level of success or mobile shooting accuracy without reading defensive coverages and making quick, expert decisions. In his 10th year, the athleticism and speed will only be on a downward trajectory from here. Where the all-time greats improve as they hit their early thirties is mentally, and it’s exactly what we’re seeing with Curry becoming wiser and a more fastidious offensive player. Golden State has this hilarious luxury: There’s a popular argument that Curry isn’t even the best on his own team. That sentiment, however, probably should’ve died once his absence was felt this season. In the 11 games Curry missed due to a strained groin, the Warriors went 5–6 and were outscored by 1.6 points per 100 possessions. They shot 34.4 percent from three (20th overall) and generated just 21 “open” or “wide-open” three-point attempts per game — a bottom five amount. In the 16 games Curry has played, Golden State is 13–3 (a 67-win pace), and have outscored opponents by 10.6 points per 100 possessions. Their three-point percentage in those 16 games is 42.1 percent (1st overall) and they generate 26 open or wide-open attempts per game. Durant’s length allows him to create a much larger array of shots. His recent stretch of 40-plus point games and wicked mid-range efficiency likely has him on the short list of MVP favorites right now. Nevertheless, Durant doesn’t completely alter the geometry of basketball, force opposing coaches to have mid-game panic attacks, or pull two (and sometimes three) off-ball defenders at a time with his movement. And he’s the only one in the league that’s equally as dangerous without the ball as he is with it. He isn’t a piece of Steve Kerr’s system. He is the system that Kerr integrated new parts into. It shouldn’t be possible to hit 84 threes in 16 games, especially since that’s more than Curry nailed to begin 2015–16, the unanimous MVP season. That’s where he is right now, as comical as it sounds. It puts him on pace for over 360 made triples if he plays 70 games (only missing one more). 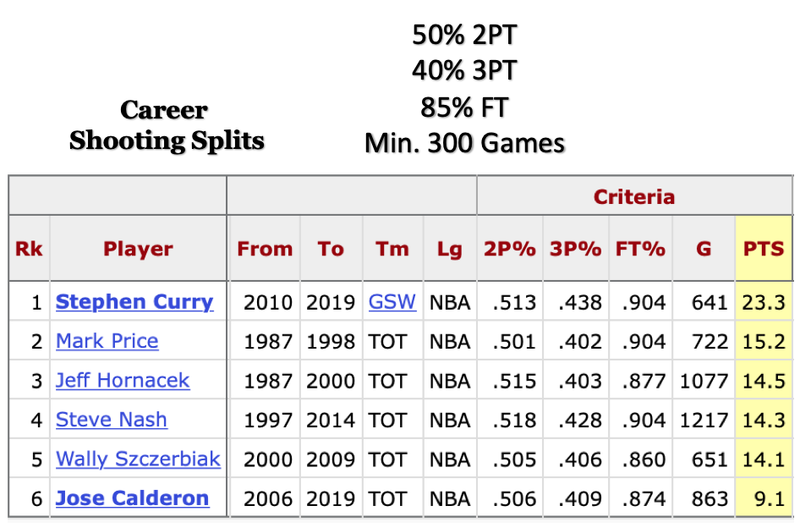 The only player in history to connect on 280 threes or more in a single season is Curry … three different times. One of those was 2015–16, which won’t be matched this year due to the early injury. He hasn’t taken as many of the crazy pull-up threes in transition that defined the 2016 season — currently 19 fewer pull-up attempts — but his efficiency on those is back to the same level. Shooting 13-of-24 (54.2 percent) on all corner threes and 71-of-141 on above-the-break triples (50.4 percent), Curry is setting the entire perimeter aflame. He’s actually enkindling defenses from the most important areas on the floor, particularly when you consider his above-average restricted area efficiency also comes with a bunch of guaranteed points if he’s fouled at the rim. 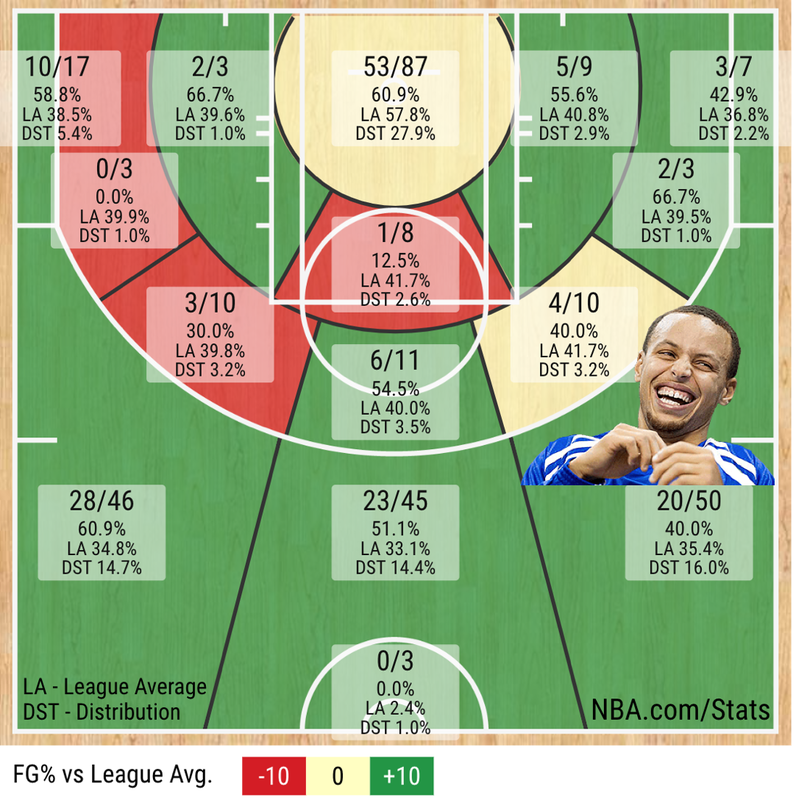 Curry’s mark of 1.52 points per field goal attempt is higher than all other point guards by a mile. Ben Simmons, who’s 6'10" and takes most of his shots at the rim, is second with 1.42, while Damian Lillard’s 1.37 is third. James Harden, who’s considered a point guard when Chris Paul is out, is relatively close at 1.48 points per shot. However, that’s with Harden attempting 135 more free throws than Curry thus far. 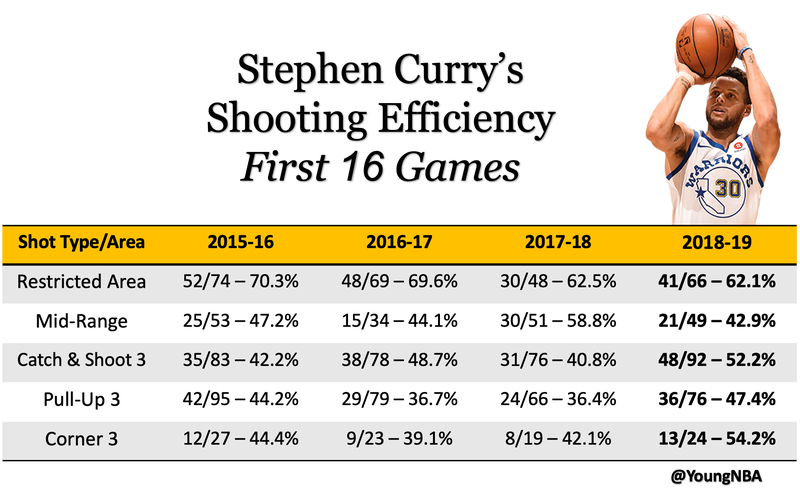 For more context on how wild this start this, Curry’s 1.52 points per shot attempt ranks behind only six centers, the type of players that usually have the easiest looks at the basket and shoot 60-plus percent from the field. It’s tied with Antetokoumpo and comfortably ahead of James and Durant. Upon Kerr’s arrival to Golden State in 2014, the offensive creativity and manner in which the Warriors generate looks for Curry definitely changed. It became more movement-based, putting an emphasis on allowing multiple playmakers more freedom and letting the Splash Brothers combo work off the ball. 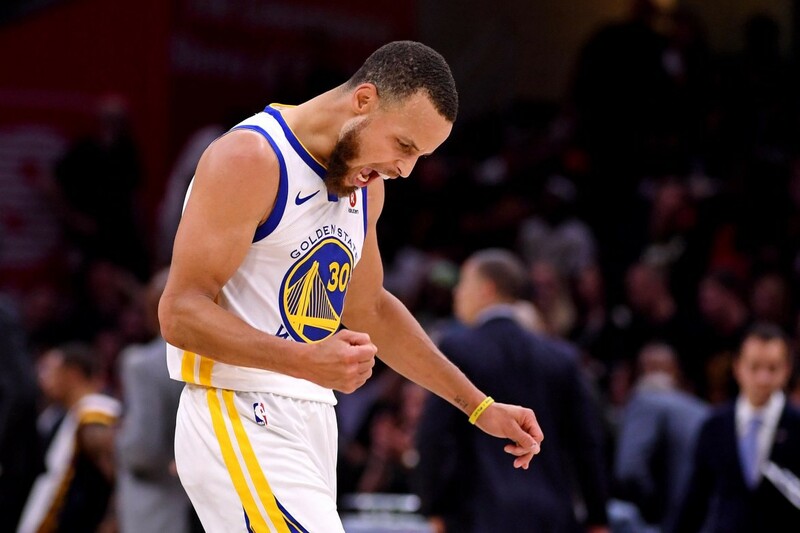 While it undoubtedly worked to the team’s benefit, Curry still matured into the deadliest on-ball shooting threat in history, able to create his own looks by manipulating defenders and creating space in the most brilliant ways. Now, there’s just an unquantifiable fear when Curry has the ball on the perimeter waiting for a screen. He has eliminated the margin for error you have in pick-and-roll defense. Big men around the league aren’t stupid. They know they have to step up further when Curry and his center initiate pick-and-roll action. But, they also know they can’t allow Curry to zip by them off the dribble — once he’s penetrating inside, rotations have to come and the Warriors simply have too many weapons to capitalize on mistakes. Then, there’s the whole dilemma of trying to chase him through off-ball routes. Unless it’s a switch-heavy scheme, defenders are taught to fight through every screen possible when chasing shooters around the court. Communication has to be apparent on every possession. Against the Warriors, switching off the ball takes insane preparation, which is why only the elite championship contenders are able to consistently try it. If you aren’t switching, the key in every scenario is to trail as closely as possible after the screen(s), and make sure the offensive player feels your presence. You can literally be right there, with an extra defender stunting at him, and it doesn’t matter. That is completely disgusting. Caris LeVert knew what was coming, closed out as well as you possibly can, hit Curry on the arm, and still had to eat three points. Kerr has repeatedly said that he doesn’t love a traditional pick-and-roll focused offense because of the predictability. It makes a lot of sense and you can’t argue with three championships in four years. The beauty of the game is achieved through different forms of attack and should always fit the nature of your roster. The Warriors are always 29th or 30th in pick-and-roll usage, but in the top two of effective field goal percentage and points per possession in those plays as well. This is why there has been a loud outcry for more screen-roll action when the usual offense is in a funk. It turns out, Curry and Durant are pretty darn good pick-and-roll players. When they screen for each other, it’s a work of art and essentially the most unstoppable action in the league. It should be noted, guards that shoot with a high volume and accuracy don’t always have to set hard screens. In fact, Curry often “slips” them in this action, which is equally as effective in most cases. Whether he’s setting a screen for Durant or slipping it, how quickly all of his takes place is what makes it impossible to guard. We saw a bunch of this during the 2017 and 2018 Finals when the Warriors were very mean to the Cavaliers and forced them to pick their death. If you switch it, Durant is going to have a smaller defender on him and bury a shot with ease. Any type of hedge and recover strategy will lead to Curry flaring open for a brief moment. With how smooth Durant can facilitate now, that’s a problem. First, the Nuggets “ice” the first Durant screen, trying to send Curry away from the middle. Then, Durant instantly re-screens Murray. It triggers another screen from Damian Jones, but Curry gets no separation with Jokic stepping up. Curry kicks it back to Jones, who then dumps it down to Durant in the mid-post. Curry realizes Jokic is going to sag back and shadow Durant in the post, so he spins away from Murray and sprints back to the strong side. Jones screens Murray, and Jokic is too far away from the perimeter. Splash. Durant’s playmaking and ability to make decisions from the elbows is an underrated part of his game. In what sounds like an obvious “duh” statement, the Warriors having another first option offensively has allowed Curry to take advantage of any extra help sent to Durant. Diverting attention is the main principle of this Warriors offense. It became even more of the goal when Durant signed. Kerr has found a healthy balance between Durant posting up in his favorite spots and Curry being able to cook in his strongest areas. Perhaps the best way they trick the defense is through the following sideline out-of-bounds set. I’ve rarely seen it fail to generate some type of quality shot, whether it’s from Curry or someone else. In reality, the Warriors are trying to get Curry’s man confused. Once Durant heads to the strong side, multiple eyes are on him. This includes Curry’s man. If the defense is really bad, they will switch without any communication. So much attention to detail and flawless execution is needed to defend this. That’s why nearly every shot is going to be wide-open or semi-open for Curry — most teams don’t have the discipline to get through every step without any issues. For almost all of the outstanding three-point legends throughout NBA history, they relied on the help and offensive flow of their teammates to find their sweet spots. There is absolutely nothing wrong with that. It’s how they grew up playing and believing how basketball should always work. The game was different. More importantly, the definition of what was considered a good shot versus a bad shot was different. Ray Allen, the NBA’s all-time leader in three-pointers made, had 84.6 percent of his career triples assisted to him. Advanced shooting data wasn’t around for most of Reggie Miller’s career, but his last five years featured 90.5 percent of his threes being assisted. For Kyle Korver, it’s 96.6 percent. After 10 years and 2,213 three-point makes, only 61.1 percent of Curry’s long-range bombs have been assisted by teammates. That means he has 860 unassisted threes created on his own, not in catch-and-shoot situations. During his 2015–16 season, when he drained 402 total, only 54.7 percent of them were assisted — the second-lowest proportion of his career. It’s utterly absurd. The truth is, nobody in NBA history has mastered the craft of pulling up on command, whenever they feel like it, and genuinely believing there’s a great chance it’s going in. Until this dude. His subtle change of direction throws opponents into a frenzy, unsure of where he’s going until the very last step. In the second play above, he’s charging down the court with George Hill on his hip. He goes from full acceleration forward to a quick deceleration back. The four-step backpedal (while dribbling) is all he needs to create separation for a three. Eventually, Nikola Mirotic comes from the paint to be the last hand Curry sees. He still makes them pay. 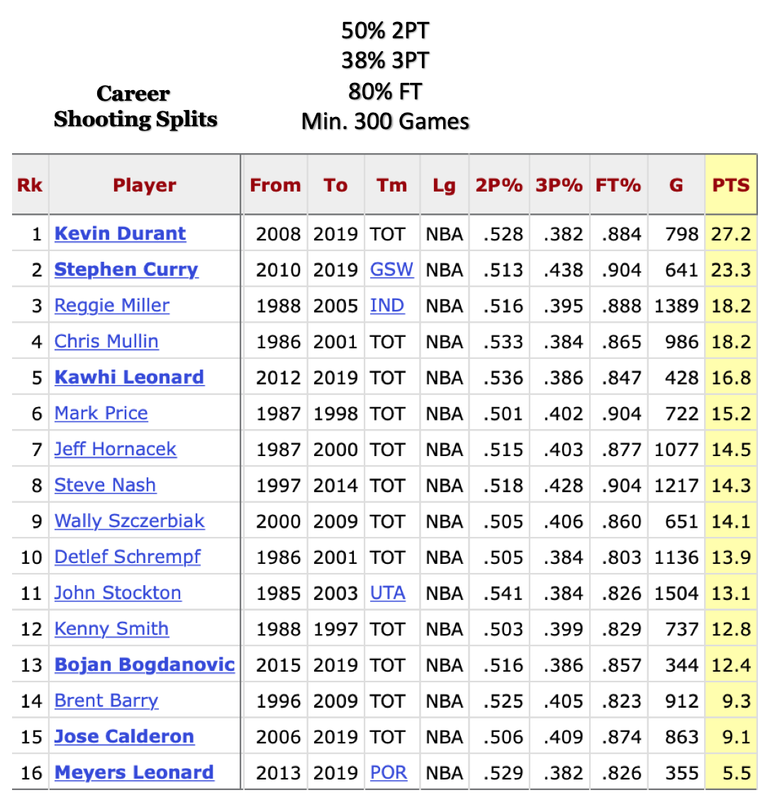 After that, the list of true 50–40–90 career guys (not the ancient way that includes 50 percent overall shooting) includes just Curry, Steve Nash, and Mark Price. Out of those three, Curry has scored by far the most at 23.3 points per game and taken shots with such a larger degree of difficulty than Nash or Price. For his efficiency to be where it is, despite the way he plays, is completely unheard of. He’s on pace to break Allen’s three-point record by age 33, with probably five or six years left in his career. Nobody would’ve guessed it four years ago, but Curry is rapidly climbing the ladder of all-time NBA greats — period. He’s already the second-most accomplished point guard ever. He’ll have a chance to surpass Magic Johnson in that regard if the Warriors stay intact. The historical debates and résumé comparisons can remain on the backburner for the time being. It’s best to focus on the present. Right now, there’s nobody better or more impactful than Curry playing the game of basketball.